We pride ourselves as an active amateur radio club, taking part in a variety of ham radio activities, regular meetings, contests and special events. 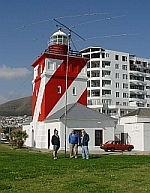 We regularly operate using the club callsign ZS1CT/L during the International Lighthouse and Lightship Activity Weekend, the SARL Field Day contest, the PEARS VHF contest, Jamboree on the Air (JOTA). Foxhunts and other special events. Club members are also active in other contests, especially the SARL HF CW and SSB contests. In addition, the CTARC holds an annual mega flea market at the clubhouse on the first Saturday in March. This very popular event enables radio hams to trade ham radio equipment and components, sometimes with great bargains to be found! Occasions like these give newer radio amateurs the opportunity to learn from the old hands and are enjoyable social occasions. Our club's ongoing activities are announced and recorded on our blogspot.